Geothermal groundwater springs of the sodium-chloride-bicarbonate type modify the chemistry of streams that drain La Selva Biological Station. These springs are NOT elevated in temperature and the waters have long since cooled during lateral transport. Streams receiving geothermal waters are solute-rich and co-occur with solute-poor streams that do not receive geothermal inputs. Geothermal waters contain high concentrations of Ca, Fe, Mg, Na, Si, Cl, SO4, soluble reactive phosphorus, and total phosphorus. Most geothermal waters that have been identified to date issue near the terminus of the youngest lava flow known for La Selva. 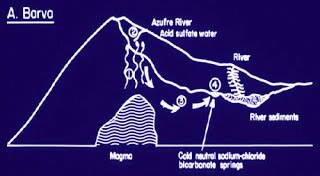 The two major streams of La Selva, the Salto and Sura, are both modified by inputs of geothermal waters and their main channels follow the lateral margins of the youngest lava flow, where it overlies older flows. Discharge points of geothermal seepages appear to be determined by the shape and hydrogeological properties of the lava flows and possible faulting. The lower watershed of the Salto exhibits a large spatial variability in phosphorous concentration (5-250 mg L-1) and conductivity (25-440 mS cm-1) that reflects the heterogeneous location of geothermal seepages. Spatial and temporal pattern in nutrient limitation of algal growth in light gaps are controlled by the presence / absence of geothermally- introduced phosphorus and / or physical / hydrologic characteristics of the stream channel that influence surface-subsurface exchange rates (Pringle 1991). Surface waters draining three different volcanoes in Costa Rica, ranging from dormant to moderately active to explosive, have a wide range of solute compositions that partly reflect the contribution of different types of solute-rich, geothermal waters. Three major physical transport vectors affect flows of geothermally-derived solutes: thermally driven convection of volcanic gases and geothermal fluids; lateral and gravity-driven downward transport of geothermal fluids; and wind dispersion of ash, gases, and acid rain. Specific vector combinations interact to determine landscape patterns in solute chemistry and biota: indicator taxa of algae and bacteria reflect factors such as high temperature, wind-driven or hydrologically transported acidity, high concentration of various solutes, and chemical precipitation reactions. Many streams receiving geothermally-derived solutes have high levels of soluble reactive phosphorus (up to 400 mg L-1), a nutrient that is typically not measured in geochemical studies of geothermal waters. Geothermal activity along the volcanic spine of Costa Rica provides a natural source of phosphorus, silica, and other solutes and plays an important role in determining emergent landscape patterns in the solute chemistry of surface waters and aquatic biota (Pringle et al. 1993). 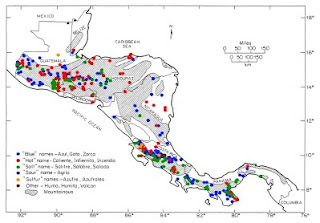 In tectonically active regions of Central America, it is common for solute-rich groundwater to emerge at gradient breaks within the complex volcanic topography of mountains and foothills which link with the coastal plain. 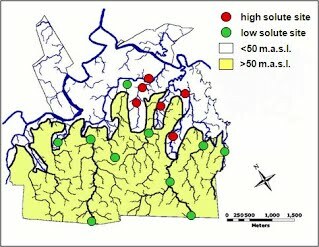 These groundwaters can significantly influence solute chemistry and related ecological and ecosystem-level processes in receiving surface waters. Many solute-rich groundwaters are associated with underlying volcanic activity which has altered the chemistry of receiving streams throughout Central America. Geothermally-modified groundwaters, surfacing at the gradient break between the Central Mountain range and the coastal plain at La Selva Biological Station, have high levels of P (up to 400 mg SRP L-1) and other solutes (Ca, Cl, Mg, SO4) but are not elevated in temperature. Spatial patterns in stream solute chemistry are determined by geomorphic features of the volcanic landscape that include: upland lavas drained by P-poor streams; a gradient break (~50 m.a.s.l. ), at or near where P-rich springs emerge; and lowland alluvial areas drained by streams that are both P-rich and P-poor depending on whether they receive the input of solute-rich springs. Dots in the Central American map show the location of rivers with names that are allusive to inputs of solute-rich groundwater. Names include references to hot waters (e.g., caliente, infernito), sulfur (e.g., azufre), salts (e.g., salitre, salado) and others (e.g., volcan, humo). Leaf litter breakdown was examined at La Selva as part of a latitudinal gradient that also included Michigan and Alaska. Results indicate that while processing rates (per day) were fastest at the Costa Rica site (as expected), rates at the Alaska and Michigan sites were similar to each other, which we would not predict if temperature were the principal factor controlling breakdown rate. If using degree days eliminates any effect of differing thermal regimes, rates should be similar across latitudes; however, rates at the Alaska site were much faster (per degree day) than rates at the sites in Costa Rica and Michigan. Three hypotheses were suggested: (i) shredding insect populations have adapted to the local thermal regime, and invertebrate-mediated processing rates are either similar between regions (showing no latitudinal pattern), or increase with latitude; (ii) microbial populations are less active at colder temperatures, and the rate of microbially mediated processing of leaf litter will show a decrease with latitude, and consequently (iii) the relative importance of invertebrate v microbial processing changes on a latitudinal gradient, with invertebrates being more important at high latitudes (Irons et al. 1994). Leaf litter chemistry is an important controlling factor on leaf litter breakdown.We measured chemical changes of leaves and breakdown rate of eight common riparian species in a stream draining La Selva. We found that structural compounds, such as cellulose, are the best predictors of breakdown rate and that fungi and bacteria are more important than macroinvertebrates in driving decomposition (Ardon and Pringle 2008). We compared initial litter chemistry and breakdown rates of common riparian species from a temperate (Coweeta Hydrologic Laboratory, NC) and tropical site (La Selva). The variation in initial litter chemistry among species was similar between the two sites, but tannin concentrations decreased breakdown rates only of Coweeta species (Ardon et al. 2009). Landscape variation in phosphorus concentration affects leaf breakdown rates. Our work has shown that decay rates of leaves, fungal biomass, and invertebrate biomass follow a Michaelis-Menten relationship to soluble reactive phosphorus concentration (which varied between 5 and 250 µg/L among streams). Results suggest that differences in decay rates were the result of differences in microbial activity among streams (Rosemond et. al. 2002). Furthermore, macroconsumers decrease biomass of small invertebrates and increase decay rates of leaves (Rosemond et. al. 2001). We have also shown that leaf litter quality determines the magnitude of the P stimulation of microbial respiration and fungal biomass (Ardon et al. 2006, Ardon and Pringle 2007). We expected that nitrogen could become secondarily limiting under high P conditions, but we did not find evidence for secondary N limitation for leaf breakdown, microbial respiration or fungal biomass (Stallcup et al. 2006). The role of omnivory in structuring stream communities is potentially great in lowland neotropical streams that are characterized by an abundance of macroconsumers (i.e., fishes and shrimps) which consume both insects and algae. Our results show the importance of: (1) conducting experiments in a relatively natural depositional environment subject to natural background erosion and sloughing (i.e., use of electric exclosures); (2) evaluating effects of natural densities of both diurnal and nocturnal macroconsumers through time in the context of these natural abiotic effects; and (3) distinguishing between the response of different types of algal resources (e.g., diatoms versus greens and bluegreens) which are differentially affected by sedimentation and erosion. We found no evidence of a trophic cascade. 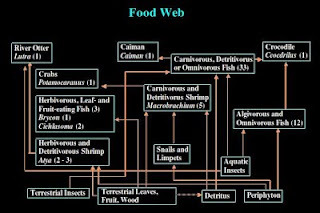 Our findings are in agreement with the theoretical prediction that large-sized omnivores have strong direct trophic (feeding) effects, both on smaller primary consumers (insects) and basal resources (algae) (Pringle and Hamazaki 1998). The role of biotic factors (natural assemblages of omnivorous fishes) in controlling the response of primary producers to physical disturbance (frequent high discharge events). Our results show that fishes play a key role in maintaining the stability of benthic algal assemblages and their resistance to storm events. Furthermore, results suggest that in the absence of omnivorous fishes, high discharge events would play a major role in structuring benthic algal assemblages, resulting in extreme fluctuations in algal biomass (Pringle and Hamazaki 1997). Effects of macroconsumers (i.e., fishes and shrimps) on detritus and detritivores. Results indicate that macroconsumers decrease densities of small invertebrates inhabiting leaf packs, mainly of collector-gatherers, and that decay rates of leaves are not affected by insect densities, but are affected by the presence of macroconsumers (Rosemond et. al. 1998). In addition, studies assessing the role of macroconsumers vs. nutrients in controlling insect assemblages indicate that nutrients are more important than macroconsumers in controlling insect densities (Rosemond et al. 2001). Stable isotope ratios were measured in major trophic levels in three streams of varying trophic complexity that were located at two major Neotropical research sites: La Selva in Costa Rica and Luquillo Experimental Forest in Puerto Rico. In all streams, nitrogen isotopic values increased with increasing trophic position of the species. The shrimp Macrobrachium was more of an omnivore in Costa Rica than in Puerto Rico. Differences in isotopic values at the base of the food web between Puerto Rico and Costa Rica were attributed to larger contribution of remineralized nitrogen to and within the stream in Costa Rica (Kilham and Pringle 1998). Food web studies at La Selva have focused on the following objectives: (1) assessing the bottom-up effects of geothermally-introduced phosphorus on benthic community structure and function; (2) assessing the top-down controls on benthic insect assemblages by macroconsumers in phosphorus-rich and phosphorus-poor streams; and (3) simulating the effects of geothermally-introduced phosphorus on benthic stream communities in a phosphorus-poor stream, through whole-stream phosphorus enrichment. Results indicate that: (1) accrual of algal standing crop is greater in geothermally-modified phosphorus-rich streams than in unmodified streams (Pringle et al. 1986); (2) instantaneous growth rates of detritivores (Chironomidae) are greater in high vs. low phosphorus stream water measured in the laboratory (Rosemond et. al. 2001). (3) top-down control on benthic insect assemblages by macroconsumers was similar in phosphorus-rich and phosphorus-poor streams (Ramírez and Pringle 2004). 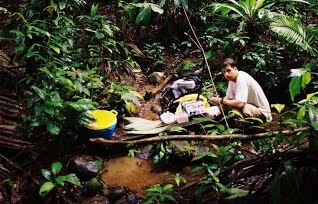 Ecological Stoichiometry The range of dissolved phosphorous concentrations in La Selva streams results in a wide range of P-content in basal food resources (detritus and periphyton). Phosphorous is an important element for growth and development. We are measuring how consumers respond to the P-content of their food resources in terms of their body elemental composition, growth rates, RNA content, and rates of nutrient recycling. Results indicate thatin high P streams, basal resources are enriched 5-fold and invertebrate consumers are enriched 2-fold in P-content (Small & Pringle, submitted). This bottom-up stoichiometric effect of chronic nutrient loading over millenia extends to fishes, which recycle P at a greater rate in High-P streams. Benthic insect assemblage structure differs among stream habitats (riffles and pools). Assemblage composition is similar to that reported for other areas in Central America and is dominated by the orders Ephemeroptera (Tricorythodes, Leptohyphes, Thraulodes, Baetis? ), Coleoptera (Elmidae), and Diptera (mainly Chironomidae). Collector-gatherers are the dominant functional-feeding group and very few shredders can be found. 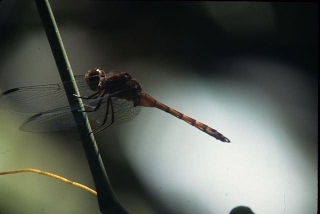 Insect secondary production is low compared with temperate streams, most likely because of the dominance of non-insect invertebrates, such as shrimps. Habitat-weighted secondary production was 373.16 mg AFDM m-2 y-1 (Ramírez and Pringle 1998). Invertebrate community composition was assessed along an altitudinal gradient from the Barva volcano (~3000 m.a.s.l.) to the lowlands (30 m.a.s.l.) using two sampling techniques: drift and Surber samplers. Both sampling techniques indicated that Diptera (Chironomidae) and Ephemeroptera were the dominant insect groups at all sites. Disturbed streams draining banana plantations were dominated by Chironomidae and had lower taxon richness and diversity than other sites. While data from benthic samples indicated that insects were the major faunal component (> 90%) at all sites, drift samples were dominated by larval shrimps (> 50%) at the 30 m and 50 m sites. This study shows the importance of measuring invertebrate drift, in addition to directly sampling the benthos. Drift sampling provided data on a major community component (shrimps) of lowland tropical streams, that would have been overlooked using traditional benthic sampling techniques, and in some cases provided additional information on taxon richness. Based on results of the present study, it is recommended that drift sampling be included as a standard complementary tool to benthic sampling in biological assessments (e.g., bioassessment protocols) of tropical streams, which are often characterized by migratory invertebrate species such as shrimps. Drift samples provide critical information on the presence or absence of shrimps and also on the timing and magnitude of their migration which is an important link between many tropical rivers and their estuaries (Pringle and Ramírez 1998). Mayfly (Ephemeroptera) community composition and structure was analyzed for three years at the Sábalo stream. Composition was dominated by the family Leptohyphidae and Baetidae, with the first one as dominant in terms of density. Both composition and densities presented large fluctuations over the study period, and were not related with rainfall nor was it consistent among years. Species richness was high but density was low. Fish predation seems to be the main factor controlling community structure (Flowers and Pringle 1995). Invertebrate drift densities are high in streams of La Selva compared with similar sized streams in other regions, however, benthic insect densities are relatively low. Drift is dominated by larval shrimps in lowland reaches near large rivers and by insects in piedmont and mountain reaches (Ramírez and Pringle 2000). Drift periodicity is strongly nocturnal, with peaks at 1800 h (sunset) and 0300 h. Our results suggest that nighttime drift is driven by the presence of predatory diurnal drift-feeding fishes and nocturnal adult shrimps. There are no clear seasonal patterns over both 'dry' and wet seasons, suggesting that benthic communities are subject to similar stresses throughout the year, and that populations grow and reproduce continuously (Ramírez and Pringle 1998, 2001).